You might know from my Instagram feed that I’m a little obsessed with fall scenes right now – partly inspired by the Autumn Scenes class. I wasn’t planning on doing any more classes til Christmas cards start in September (tomorrow! 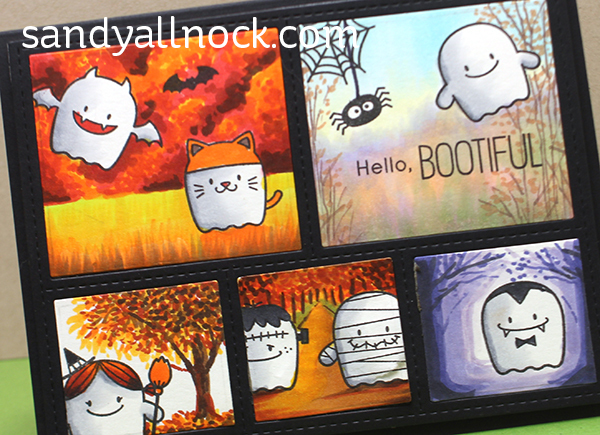 ), but my patrons encouraged me to help with a fall cards class – and now I can’t stop! 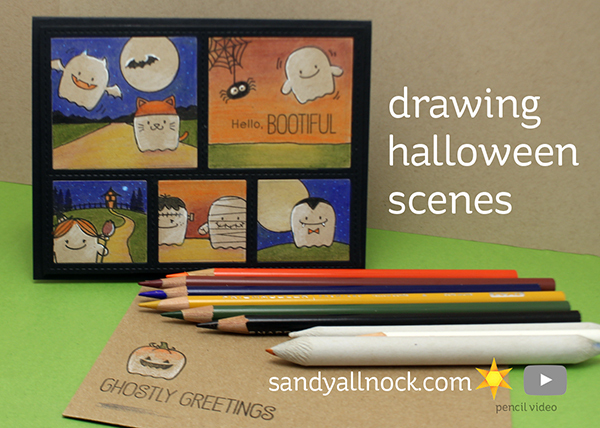 Today’s video shows all halloween-scenes in Colored Pencil with Gamsol….and at the end, see this same design but with scenes from the class in Copic marker! Watch the video below or click HERE to see it in HD on YouTube. 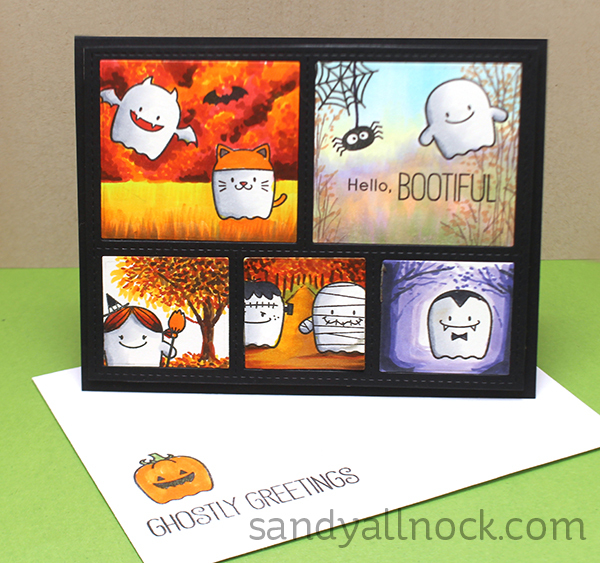 For those taking the Autumn Scenes class – try something fun like this with the lesson techniques! They’re tinier so you need to adjust the size of strokes etc, but….give it a try! 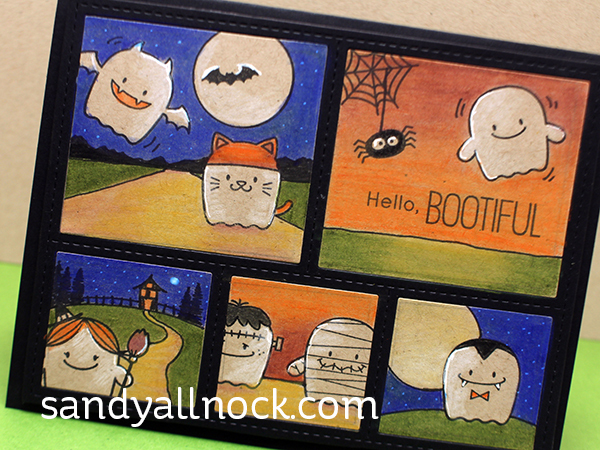 Stay tuned tomorrow for a back to school sale on Copic classes! Very cute cards! 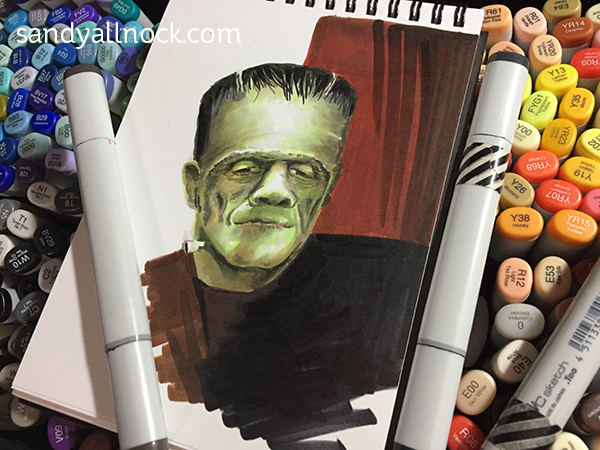 I love your Frankenstein monster. Oh phoo – you have to make them light enough that they don’t show up. Or color enough to cover them. When you use the die, it makes the lines “inside” the area that’ll actually get cut. You’ve given me some great ideas. Haven’t used gamsol in quite some time, but will give it a go. So awesome, I like the autumn sciences the most. Just finished my Autumn Scenes class – so imagine my surprise when those scenes all popped on one of your examples! *Hey, I know how to do this! *, altho the simpler backgrounds look like just as much fun. Thanks!